Choice in browsers has been an integral part in the history of computing. Mozilla has been at the heart of the push for choice in browsers from its inception out of Netscape to the introduction of Firefox in 2004. Since 2004, Mozilla has been dedicated to giving users a choice in browsers not only on the desktop, but on mobile. The latest version of Firefox for Android, available in Google Play today, comes in the midst of heavy competition in browsers for Android with Dolphin HD, Opera Mobile, Opera Mini, and Firefox each having been downloaded more than ten million times. Perhaps even more dauntingly, Google is in the process of making Chrome the default browser in Android. Chrome made headlines in the last six weeks as it surpassed Internet Explorer to become the most used browser internationally on desktops. Mozilla is keenly aware that by developing Firefox for Android they are competing with Google in a way that is much less obvious on the desktop. 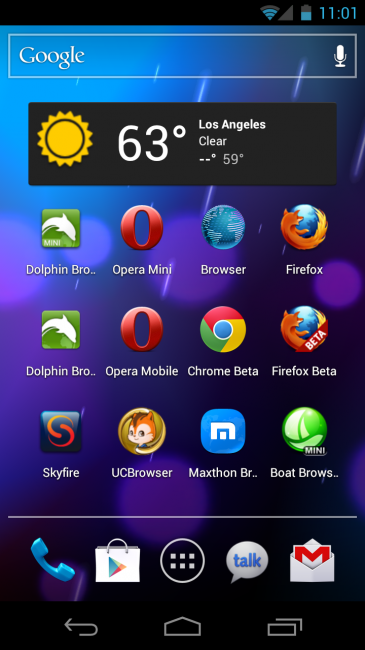 When Mozilla first released Firefox for Android way back in 2010 (then called Fennec) it went through several evolutions. Through each evolution Mozilla seemed to struggle with finding a balance between offering something that was powerful like a desktop browser, yet simple enough to use on a phone. Mozilla seems to have hit their stride with this latest release. Though the new Firefox doesn’t top either of these lists, it’s no slouch either. It’s clear that Mozilla still has some work to do, but overall these slight differences in load times is indistinguishable in regular browsing. In fact, it’s in general performance and usage that the new Firefox really shines. Manipulating web pages is an area where Firefox exhibits definite superiority over Browser and Chrome. Scrolling is smooth, especially on the desktop view of websites, whereas both Chrome and Browser scrolling can be a little jittery. More importantly, Mozilla has done a great job replicating text zoom levels that Safari for iOS offers. While Browser and Chrome simply blow up an area when it is double tapped, Firefox, like Safari, zooms in to make the text below your taps centered on the screen. This may seem like a little flourish, but it actually makes a significant difference in the user experience. In the same way, pinch to zoom works better in Firefox than it does in Browser or Chrome. Don’t get me wrong – pinch to zoom works very week in both Chrome and Browser, but Chrome and Browser have the occasional stutter, especially if pinch to zoom is initiated right after scrolling. Firefox, on the other hand, is able to consistently pinch to zoom smoothly, even after scrolling through a web page. Like Chrome, Firefox syncs your bookmarks and your browsing history between your phone and desktop. Unlike Chrome, however, Firefox does not differentiate between websites viewed on the desktop versus those viewed on your phone. This decision wasn’t because engineers were lazy; it is a manifestation of Mozilla’s vision of one Firefox across different screens. Mozilla believes that it can provide the same great experience across all three screens in your life. Part of extending a desktop experience to mobile meant bringing extensions to Firefox. As of this writing there are only four extensions available, but Nightingale assures me that like Firefox on the desktop, Mozilla expects the community to develop extensions that help create a truly personalized experience. The extensions available don’t create a personalized experience as much as they augment an already great browser. URL Fixer, for example, gives suggestions to the user when common typos in URLs are present before loading the page while Phony lets users impersonate other browsers to get web pages to load differently. The Start Screen has been overhauled to show frequently visited sites and tabs from your last session. Unfortunately, while the new Start Screen has indeed been overhauled, it is not a huge improvement over the previous iteration of Firefox. Instead of focusing on the most important data when starting a browser, the new Start Screen tries to do too much. Add-ons are not something that I want to see every time I start Firefox. Instead, it would be nice if Mozilla finished its copy of Chrome’s launch page and just showed me the websites I tend to visit the most. Mozilla’s decision to use the same layout as Chrome wouldn’t be a bad thing if they hadn’t tried to hide it with the curved layers lining the top of the browser. While the colored layers fade in well on the start screen, they rarely match the look of the website you’re actually viewing. Hopefully in a future release Mozilla will simply use the faded black used for the menu button across the top to make the UI look much cleaner. One of the most frustrating parts of the Start Page is the URL bar (what Mozilla calls the Awesome Bar). Entering a website is simple enough (especially with URL Fixer), but Firefox only populates the Awesome Bar with websites you’ve already visited as suggestions. While this is fairly normal for most browsers, Chrome has set a new standard with Google Instant. On Chrome, as soon as I start typing Google begins suggesting search queries and websites. This feature is a huge time saver, but more importantly, it makes browsing on a mobile device much less reliant on precise typography. Managing tabs in Firefox hasn’t evolved much. Taping the plus button next to the address bar gives the user three options: Top Sites, Bookmarks, and History. Once several tabs are loaded they can be accessed by tapping on the number that replaces the plus button. Tabs load in the background and the preview in the tab view refreshes live so it’s easy to check if a website has updated with new data or finished loading. That said, I still prefer Chrome’s borrowed card metaphor to a drop down list. The latest version of Firefox still has the option to save pages to PDF, which can be shared or used to browse pages offline. While the feature certainly isn’t a replacement for Pocket or other offline readers, it does provides an option to save a website at a fixed point in time. Mozilla may not want to compete in the offline reading space, so perhaps Mozilla should add support for offline readers right in the browser (i.e. not through a plug in). Being able to long press on a link and send it directly to an offline reader in one press is a fantastic feature. Is Firefox the best browser on Android? In my opinion Firefox is slightly better than Chrome, though it’s a close call. Chrome lacks any offline reading mode (despite the fact that Browser includes it), doesn’t support Flash, and offers few customization options, but it still starts the fastest, loads pages the fastest, and is integrated with Google Instant. Though Mozilla claims that Flash is a commonly requested feature, I find Flash less and less necessary and often more frustrating than useful. All things considered, Firefox is a very competitive browser, but the sloppy, borrowed design, lack of Google Instant, and Chrome’s use of the card metaphor to manage tabs keep Chrome in the number one spot in terms of design and UI. Mozilla is right about one thing, though – Firefox can be and certainly is a force for innovation in the browsing space. The performance of Firefox compared to most other browsers on Android is incredible. For most users Firefox will provide a fantastic experience on Google’s platform, rivaled only by Google’s own browser.